The Love Big Promotion is releasing more CATCH-M Trackables into the great outdoors and giving you the chance to win some awesome prizes. Get in on the adventure by searching for a CATCH-M Trackable in a geocache near you. Please complete this form to request a Love Big CATCH-M trackable game piece. Once the form closes, we will randomly choose 500 people from all eligible requests to receive a trackable. Only those living in the United States are eligible to request a trackable. Filling out this form does not guarantee that you will receive a trackable. 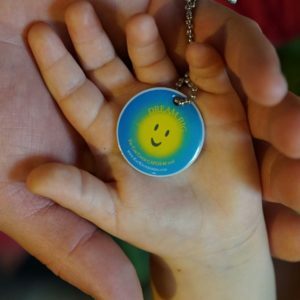 50 more trackables will be available at select Geocaching Events. More details below. 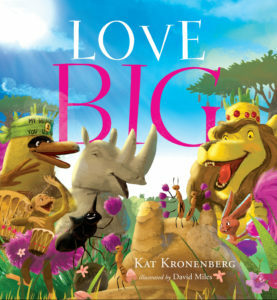 Love Big is an illustrated book for all ages written by best selling, award winning author Kat Kronenberg. The whimsical and beautiful story teaches us a “Powerful—SHHH—Secret” that the animals have passed down for generations on how to discover the treasure in our own chest. Love Big demonstrates that together we can get through any hardship when we celebrate our treasured chests and work towards our dreams together. Enjoy the book, learn the Secret, and find your treasure too. Geocachers are invited to join the Love Big movement. With a CATCH-M trackable, a magical character from the book, share your “geocaching smiles” on Facebook, Instagram, or Twitter using the hashtags #GeocachersLoveBIG #contest. 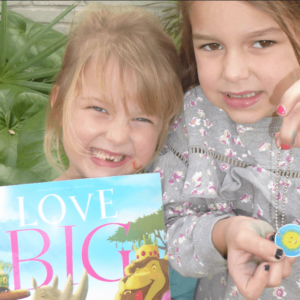 From February to April 2019, three photos that best capture smiles on geocaching adventures will be selected each month to win an autographed 1st Edition of Love Big. Those winners will also be entered to win the Grand Prize – A Free Author Visit to the U.S. location of your choice and three additional autographed 1st Editions of Love Big. The Grand Prize winner will be announced in May 2019. See official rules for details. Want to read the inspiring book yourself? Go to www.katkronenberg.com or Amazon to order Love Big. Attend a Geocaching Event for a chance to meet Kat Kronenberg and pick up a trackable! Find a Love Big trackable near you!